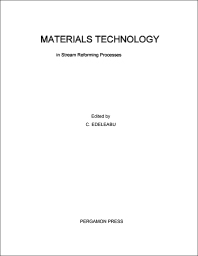 Proceedings of the Materials Technology Symposium Held on October 21-22, 1964, Organised by the Agricultural Division, Imperial Chemical Industries Ltd.
Materials Technology in Steam Reforming Processes is a collection of papers that covers advancement in the various areas of studies in steam reforming processes. The title presents the studies of authors who are involved in the development of a particular process. The coverage of the text includes the fundamental aspects of the creep deformation of metals; factors affecting choice of materials and design of units for pressure steam reforming; and the research background of the thermalloy grades of chromium-nickel-iron heat-resisting alloys. The selection also covers corrosion problems on finned air-cooled heat exchanger tubing; and thermal insulation for steam-reforming plants. The book will be of great use to scientists, engineers, and technicians involved in materials science. Introduction to The Use of Cast Alloy Material for Hydrocarbon Processing in the U.S.A.